Skin care and makeup have risen to an all new level. Indulge yourself or someone else with this super-softening treat for hands and feet. 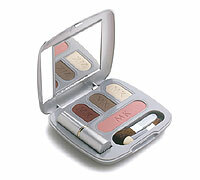 The set includes these four pampering, skin-smoothing products in a handy go-anywhere bag: 3 fl. oz. Satin Hands® Cleansing Gel, 3 oz. Buffing Cream and Hand Cream, and 2.1 oz. Extra Emollient Night Cream. Plus, you'll receive easy-to-follow steps for treating yourself to the softest hands and feet ever.